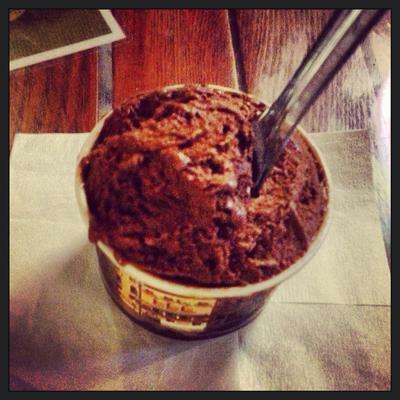 What's better than gelato on a warm summer's night? Nothing! Italian ice-cream? Yum! So when a friend mentioned he'd found a gelato bar, I jumped at the chance to enjoy some sweet dessert. We arrived just after 8pm on a weeknight and immediately there was a rush of people, which lasted most of the remainder of their opening hours. Being a chocoholic, I had very little difficulty choosing Dutch chocolate, and settled into a seat to spike my blood sugar with delicate delights and catch-up with my friend. There are options for the lactose-friendly and lactose-free folk, and the gelato and sorbet is made in small batches. They even make special holiday flavours, recently producing a batch of lamington and vegemite gelato. On my must-try list for next time: ginger gelato, and chilli and chocolate gelato. Gelateria Cremona is open afternoons and evenings until 10pm, seven days a week. You can like them on Facebook here.